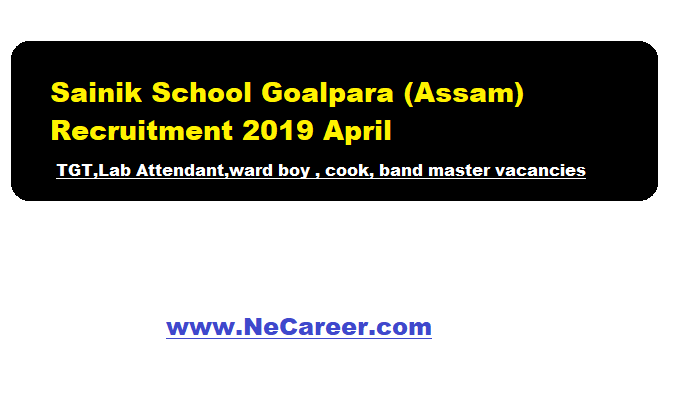 Home » Assam » Sainik School Goalpara Recruitment 2019 April | TGT,Lab Attendant,ward boy , cook, band master vacancies. Sainik School Goalpara Recruitment 2019 April | TGT,Lab Attendant,ward boy , cook, band master vacancies. Sainik School Goalpara Recruitment 2019 April | TGT,Lab Attendant,ward boy , cook, Band master Posts:- Welcome to North East India's No. 1 Job Portal NeCareer.com . Sainik School Goalpara Assam has issued a recruitment notification in April 2019 for various posts. Applications are invited for various Contractual Posts at Sainik School Goalpara. The details of the vacancy are mentioned below. (b) B. Ed in the subject from a Recognised University / Regional College of Education, NCERT. Eligible and Interested candidate may apply with application form. Along with the application passport size photograph, contact address, number, resume along with attested copies of mark sheets, testimonials and demand draft of Rs. 200/- (non refundable) drawn in favour of "Principal, Sainik School, Goalpara payable at SBI, Mornoi (code 9148), must be enclosed. Duly Filled in application along with necessary documents must reach the following address on or before 3rd May 2019. "Principal Sainik School Goalpara, PO. Rajapara, Dist. Goalpara (Assam), Pin. 783133"